Happy Wednesday everyone! 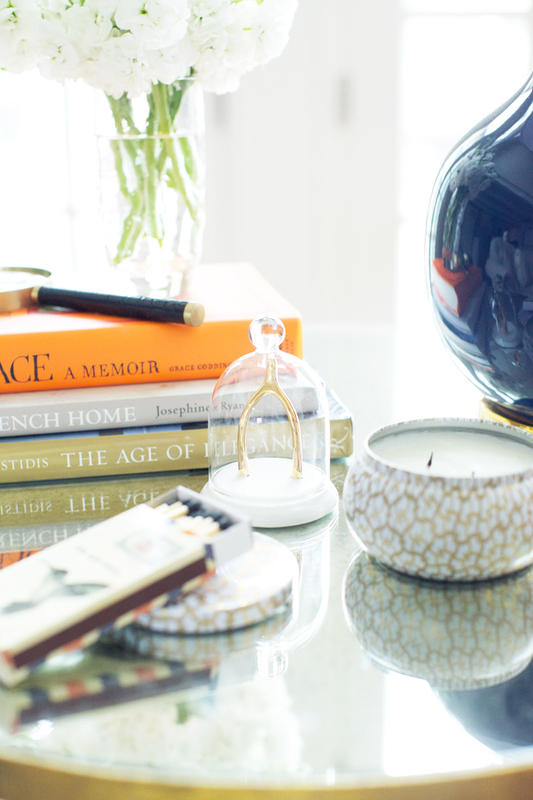 I’ve had so many of questions asking if and when I’ll be sharing a home tour on my blog. Well, the truth is there’s still a lot of decorating to be done. It’s such a process and furniture can be a big investment so I’m decorating slowly, little by little. Thanks so much for reading, have a wonderful day! Your home looks amazing. Esp love the gold lamp. It’s perfect. I love Lulu & Georgia! I got a pair of statement Labrador book ends (they look like my dog and Dash as well!) there last year, and I always get compliments. 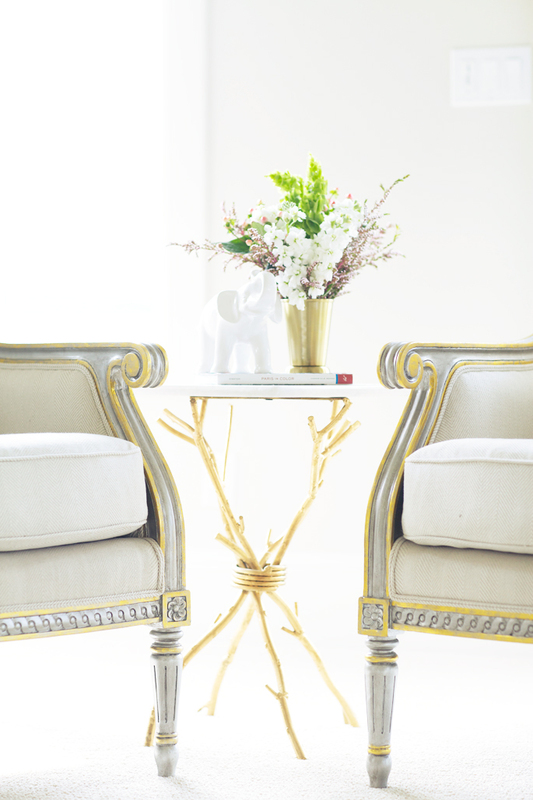 That side table with gold legs is such a great piece! Gorgeous!! Decorating is so much fun so I’m sure you’re having so much fun!! LOVELY pieces- all add such a glamorous touch too! Must check out Lulu & Georgia for our new home in Florida! Wow, what a beautiful home you have! Your accents are perfect – especially loving the horseshoe. Such a beautiful decoration! Your house is a dream house, Rach! Fabulous pieces! Your decor is amaze, naturally! Pretty sense of style! Love the look of your home! Your home is so beautiful! Wonderful decorating, can’t wait to see more :) Thanks for sharing Rach!! I love the twig table and that little wishbone is a great accent piece. I love little trinkets like that! I’m in the middle of decorating my first apartment so your home tours are super helpful! Everything looks amazing! I love seeing bits and pieces of your new home! Lulu And Georgia is one of my favorite sites for home shopping! Oh my gosh that nightstand is EXACTLY what I have been trying to find for my bedroom! Where did you find that? Love love. I just love how clean white looks. 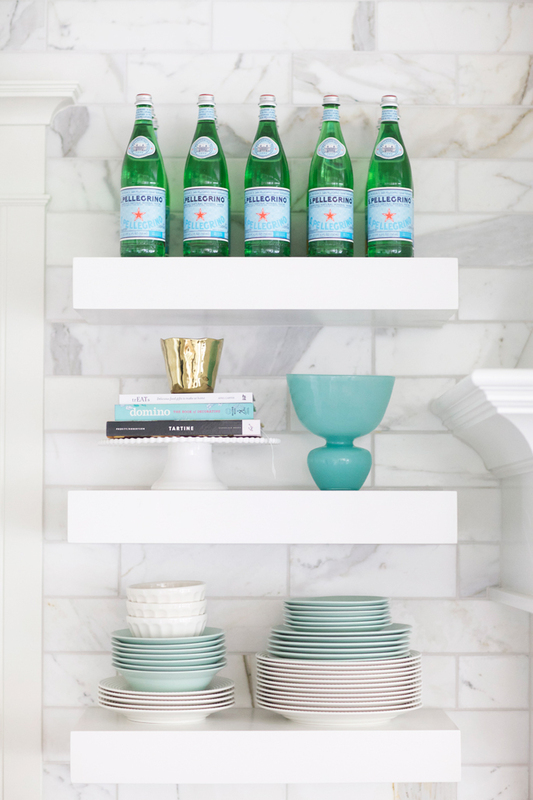 I also totally love the shelves in the kitchen, they are so cute for organizing and decoration. Very beautiful! Where is the headboard and side bed table from? This is a great inspiration for my own bedroom! Absolutely love the design! The white chairs are my favorite! Absolutely gorgeous! I love all the natural light as well. You’ve done an amazing job! Rach I get so excited when I see some pieces of your house. It’s just gorgeous… I know what you mean though about decorating… it’s a very slow process! Take your time so that it’s perfect :-) Thanks for sharing the discount! I saw on IG a while back you had gotten some things there and I’ve had my eye on some of their pieces! Stunning photos! Such an inspiration! I love Lulu & Georgia! Thanks for the coupon code! Loving the gold accents, such a compliment to the white! Beautiful home! Your home looks so fresh and clean! I love all the natural light that you get, it shows off your decor perfectly! I know what you mean about gradually decorating your home. It took me years to fill our home with the pieces I wanted and it’s still a process! 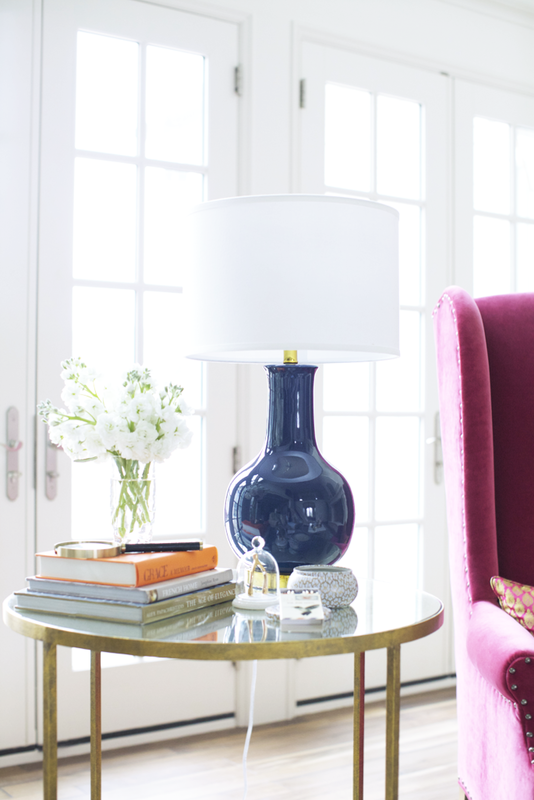 I lust love that elegant gold side table and that exquisite navy lamp! Beautiful choices! Aww dash is too cute!!! Love the accents in your home so gorgeous. Your home is absolutely beautiful. Love all the little details. Love the use of books! 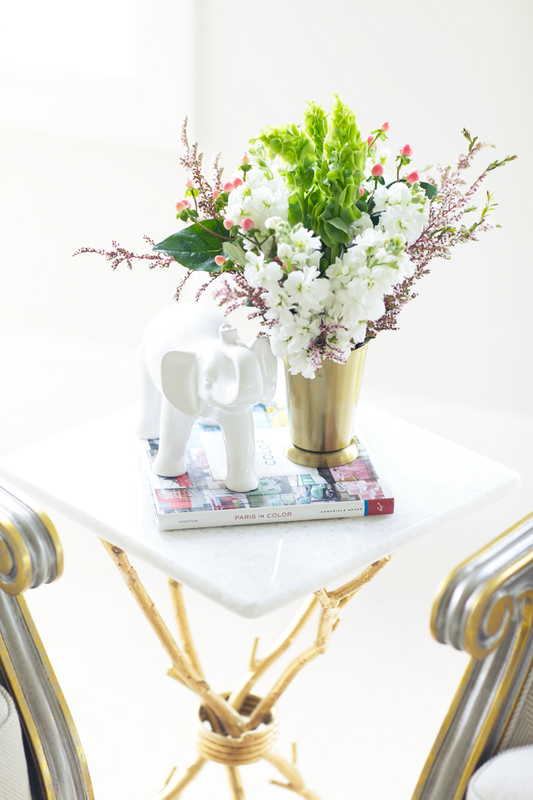 Your side table is beautiful!!! I love your interior design style! So light and airy. Can’t wait to see more. Love this! Everything looks so crisp, clean, and elegant! Love the gold accent! Very nice! I am so in love with your house…so beautiful!! what BEAUTIFUL lighting. love the trinkets in your house as well! You have so many pretty little details! Looks very nice! Beautiful photos! Love the side chairs and the bright throw. Your house is amazing! I’m sure it’s definitely a process to decorate, but it looks beautiful already! I love these photos! Love the Pellegrino in the kitchen! Gorgeous! Wow your house decoration is gorgeous! I would love to live there! Gorgeous!! Decorating takes time I totally understand. Have fun with the process. Please share where you brought your white bed comforter set at? oh wow!! these photos are simply gorgeous! You truly do have a beautiful home! Every detail is so gorgeous and so well thought out! Such a beautiful home…I love all the little colorful details. 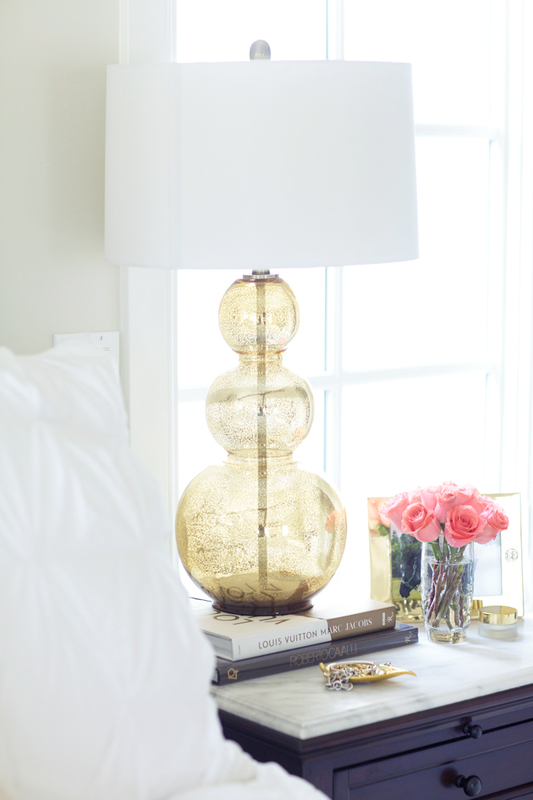 My favorite piece is that gold lamp, it’s stunning! Everything looks gorgeous and perfect down to the last detail! Ohhhh wowww. I love your home. The post is best. That flower arrangement and that table are gorgeous! Thanks for sharing. The chairs are great – are they from L&G as well? I love how it feels so fresh, airy, and light. I especially enjoy the added accessory of the sparkling water the color scheme matches with perfection. and those chairs wow the gold detailing is just enough to make it not appear bland. I also love fresh flowers anywhere. great design. so glad i cam across your blog. What color paint are your bedroom walls? Looking for that perfect white! I love love love your home!!!! You have an amazing style dear, very pretty and elegant, beautiful! Wow your home looks so chic, I love it! Love this post! Wish my house looked like this! Love the pillows. Debating if I should get them! Wow, love your style. The first table is amazing. I have not heard of this company. so neat in white, nice home Rach. Sooo dreamy… I love it! Seriously, perfection. Hey can you tell me what color of white paint you used on your walls? Can’t wait to see the end result! Everything looks lovely so far! gorgeous! we just moved into a new (small) apartment and this has me lusting for a bigger space! Love your attention to details! i am so inspired to have a white kitchen! Stunning! Such a pretty home and Dasher is the cutest!! 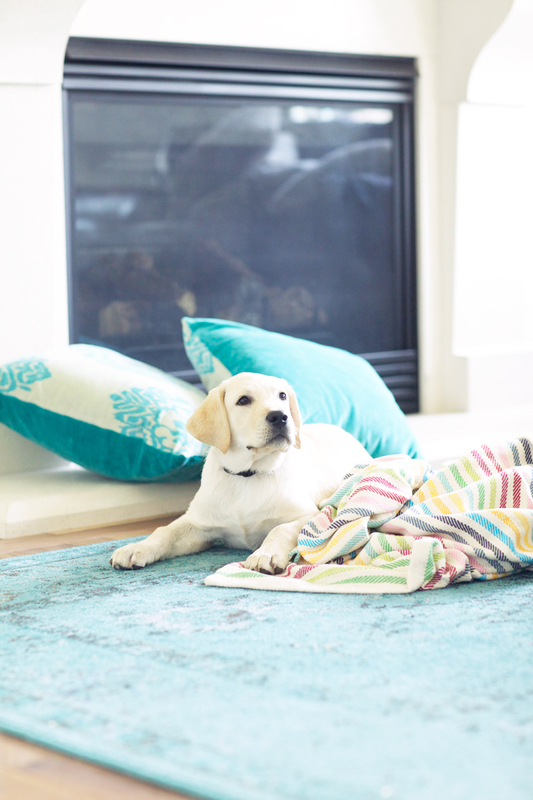 Ahhh – Lulu & Georgia is one of my fave/go-to home decor websites! I could browse it all day long. And I must admit – that little wishbone has been on my “to buy” list for quite some time now. Love that you just offered a promotional code – awesome! I love those chairs! I will be inheriting some very similar chairs that used to be my grandmother’s. I will upholster them in white also! And, I have those aqua plates as well! They were on sale at IKEA last month. Great minds think alike. Your home is beautiful and I can’t imagine the fun you are having decorating. I’m enjoying watching the process! Beautiful!! Your home is exquisite!!! I love lulu and georgia, such a cute and fun place to shop! love everything you have from lulu & georgia!! sooo gorgeous!!! The beauty lies in the details. I love the coffee table books and your elephant ornament. It’s beautiful. Love those chairs!! Where did you get those from? Such great pieces! Your home is lovely…I’m sure your having a blast decorating! I’m on the lookout for the perfect bedspread and I love the one you show! Can you tell me where you got it? Thanks! So many inspirations, just absolutely love your room! Where are the throw pillows on your bed from? Love them! Your home is gorgeous! I’m getting inspiration every time I see these photos. So many individual details, looking forward to more! 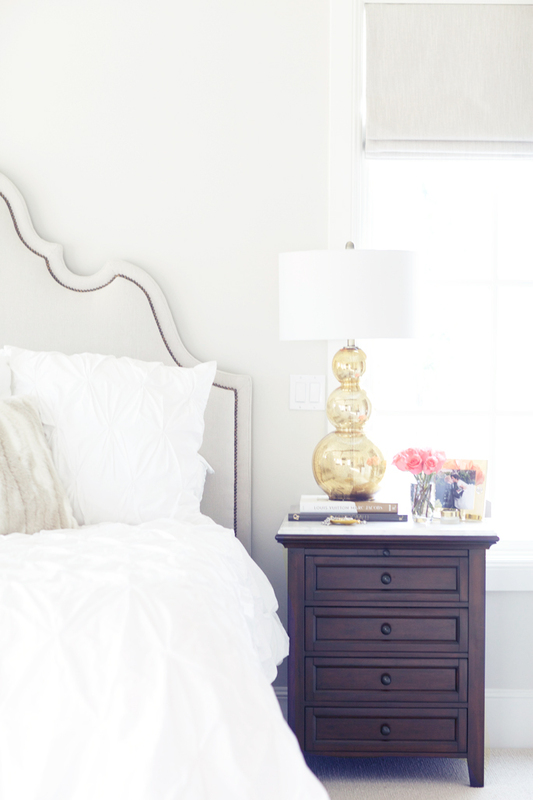 In search of an upholstered headboard, and LOVE yours! Where can u find your mint dishes, I’ve been looking everywhere for some?! Gorgeous- but I can’t help but wonder how you’ve puppy proofed? We have a 4-mo old Golden Retriever, and she is a chewer! She’s gotten to my favorite area rug, and gnaws on the legs of the coffee table (which thankfully, are metal and impervious to her sharp teeth)! Do you really let the dog in your gorgeous living room? Really love that table set-up! The gold wishbone is a really cute find. Oh my goodness those chairs are insane! Absolutely love them! Where are they from?! You have an eye for design and decoration. It looks very happy, bright, and classy!!! I absolutely loved the lamps you have picked out. You should do more on interior! Could you tell me where the nightstand in the bedroom pic is from? Thank you! I really love the simplistic style of this room! I have been looking for a bed side table just like yours forever! Do you remember where you purchased it?! I must have it. I love your blog and your style. What is wall color you used in your Master bedroom? It’s very serene. So beautiful! 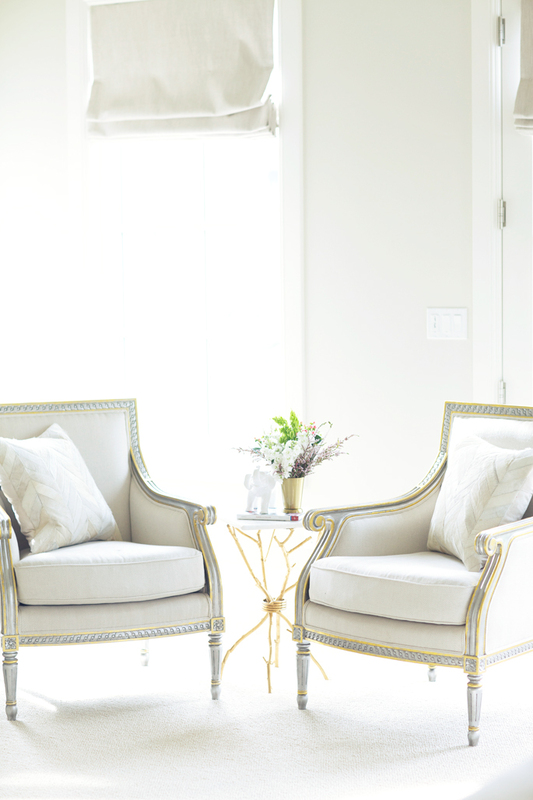 Would you please share the source for the two silver/ gold trim chairs? I have searched hi and low for your bedside tables! Where are they from?